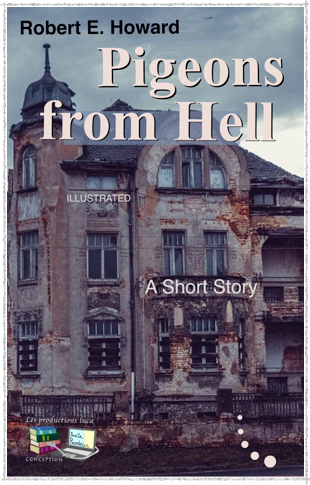 Fear, phantom, battle, abandoned house, horror, are the theme of this short, strange and mysterous story. Griswell awoke suddenly, every nerve tingling with a premonition of imminent peril. He stared about wildly, unable at first to remember where he was, or what he was doing there. Moonlight filtered in through the dusty windows, and the great empty room with its lofty ceiling and gaping black fireplace was spectral and unfamiliar. Then as he emerged from the clinging cobwebs of his recent sleep, he remembered where he was and how he came to be there. He twisted his head and stared at his companion, sleeping on the floor near him. John Branner was but a vaguely bulking shape in the darkness that the moon scarcely grayed. Griswell tried to remember what had awakened him. There was no sound in the house, no sound outside except the mournful hoot of an owl, far away in the piny woods. Now he had captured the illusive memory. It was a dream, a nightmare so filled with dim terror that it had frightened him awake. Recollection flooded back, vividly etching the abominable vision. Dreaming, he had seemed to relive his past few waking hours, in accurate detail. The dream had begun abruptly, as he and John Branner came in sight of the house where they now lay. They had come rattling and bouncing over the stumpy, uneven old road that led through the pine-lands, he and John Branner, wandering far afield from their New England home, in search of vacation, pleasure. They had sighted the old house with its balustraded galleries rising amidst a wilderness of weeds, and bushes, just as the sun was setting behind it. It dominated their fancy, rearing black and stark and gaunt against the low lurid rampart of sunset, barred by the black pines. They were tired, sick of bumping and pounding all day over woodland roads. The old deserted house stimulated their imagination with its suggestion of ante-bellum splendor and ultimate decay. They left the automobile beside the rutty road, and as they went up the winding walk of crumbling bricks, almost lost in the tangle of rank growth, pigeons rose from the balustrades in a fluttering, feathery crowd and swept away with a low thunder of beating wings.